HARRISBURG, Pennsylvania | With a little more than three weeks left in the season, only one thing is slowing us down: Our guts. Back in May, we thought we would have more time to work out and eat healthier once the drives shortened some. We were naïve. We’re tempted by ballpark food almost every night — the sweet smell of cinnamon-roasted cashews wafting through the concourse, cold ice cream on hot nights, funnel cake. Always funnel cake. Our indulgence has led to double-digit weight gains and some trouble buttoning our pants. When I started, I had every intention of running four or five miles. I started the first mile slow to pace myself. I felt great. By the time I ran a mile and a half, I started to hit a wall. I was fading fast and thinking, “You have to be kidding me.” I declared three miles would be the finish line and I barely made it. What's more frustrating? The weight gain or the slow running? Right now, with three slices of pizza in front of us (because press box food is a staple), there’s no reason to worry about it until after Labor Day. The weight will come off. (Anyone know a good detox diet?) The miles will add up. 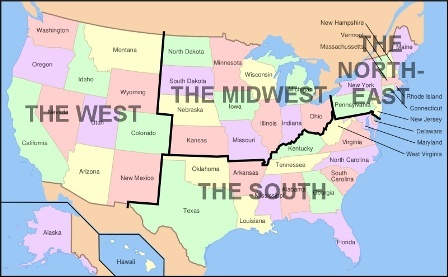 (Want to meet us on the road for a race?) There’s no way we're cooking hot dogs or hamburgers ever again. SIDE NOTE:I wrote this while watching the Harrisburg Senators beat the Binghmaton Mets in the bottom of the ninth. Today we're staying with vegetarians and gladly eating few foods found in a ballpark. The photo above are vegetables and fruits picked from the garden this morning. We sat down last month with Ben Hill to talk about journalism, road trips and, of course, baseball. Hill writes for MiLB.com and is the authority on minor league business and promotions. He travels around the country to different parks for more than a month every season, three or four trips for about a week at a time. None of that surprised us. One of the questions people routinely ask us is “How have people treated you?” We’ve received overwhelming support from fans, strangers, front office staffers, players and managers. We always talk about how generous people have been with their time (and spare bedrooms), how their support helps our efforts to better understand and share with others what minor league baseball means today. We have shared games during the last week with more than 100 family members and friends, and it was fantastic. You can’t leave jobs, put all your belongings in storage and hit the road without their support. We’re not involved in their daily lives, and we’re missing major events in their lives — like buying houses, having babies, planning weddings. They’ve understood why we couldn’t be there and have provided the encouragement needed to continue on, five more weeks. FORT WAYNE, Indiana | Back in May, when we made a pilgrimage to the National Steinbeck Center, one of the visiting exhibits was Woody at 100. Black and white photos of Woody Guthrie and his scribbled lyrics lined the walls – a wonderful surprise for we wayward travelers on a rambling journey of our own. On his 100th birthday, we pay homage to his most famous song, which, for us, has taken on a whole new meaning in the last 101 days. LAWRENCEVILLE, Georgia | The winter I turned 20, my dad called me on my dorm room phone to tell me my grandma had died. He called some time on a Friday morning, maybe 8, maybe 10, maybe noon, and I had no Friday classes that quarter, so I was still in bed when the phone started to ring. I remember that I climbed from the top bunk and shuffled across the thatch of carpet we had dropped in the middle of the room three months earlier. I remember that I picked up the phone and listened and nodded my head. And then I remember that I went back to bed. That was almost nine years ago and I still pretend that it never happened. I like to think that if I never acknowledge that morning then my grandma is still somewhere — with her family in South Carolina, with her friends in Indiana, on some long vacation down in Florida — and that she never died. She was 85, though, and she lived life, helped build an old hardware store with her husband, went back to school after his death, spent decades in elementary school classrooms teaching a generation of Midwestern children things she figured they should know. There was no reason to pretend. For years after she retired, she picked me up after school and we spent our afternoons together. Before we moved to Ohio, we ate late lunches at a spot in Highland, Indiana, called Miner Dunn. As far as my preschool brain realized, the only item on the menu was orange sherbet, perfect scoops served in little metal dishes. I spooned it out probably two times a week for four years. There was never any orange sherbet in Ohio. The week after she died, we all traveled to Indiana for her service and I carried her urn down the aisle of the church, forearms wrapped around it, afraid I was going to drop it and spill her all over the trodden carpet. Afterward, we drove to Miner Dunn — my aunt and uncle, my older cousin Brad and his wife, Debra, my parents and I — and we ate lunch. I can't remember what I ate that day and I still have no idea what else is on the menu. Say hamburgers and fries. Say whatever. Debra found a blue “R” on the sidewalk that had dropped from the heights of the marquee sign, a crack down its middle, and handed it to me. It stayed on my bookcase for years. I always tried to glue the crack. It always split apart again. For dessert that afternoon, Brad and I ordered orange sherbet, but Miner Dunn was out. I’ve skipped orange sherbet ever since, a memory best left tucked somewhere else, any other carton in the frozen aisle a better option. Carolyn and I are in the mess that is the outer rings of Atlanta, though, and we always like to eat local. I remembered reading about The Varsity, a hamburger stand famous here and in Athens, the kind of college gathering place that still exists in some cities. 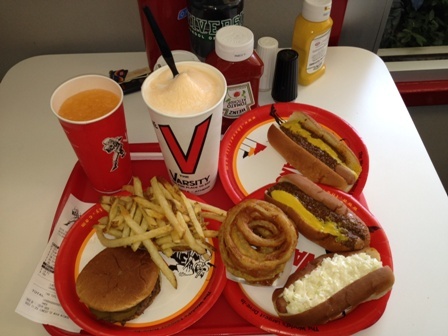 We found the shop closest to the stadium and stopped for an early lunch, filled up our tray with hot dogs and fries and onion rings, a double cheeseburger, an orange drink. To top everything and pack the last corner of the tray, I ordered a Frosted Orange, a classic blend of a milkshake and sugar without any carbonation. The moment I spooned a plastic Dixie into the quart-and-a-half cup and lapped it up, the memories poured back. Three states and 700 miles melted in slush. I shared some with Carolyn, and she smiled and said something like how good it was, and then I tried to explain to her why tears formed in my eyes, and I finished most of it myself. The double cheeseburger was patted thin, and the fries were unsalted and crisp, and the onion rings were jacketed in grease, and everything was good. But that damn Frosted Orange. I saved the last four spoonfuls — sips, really, the whole thing was so melted — as long as I could, maybe eight minutes, maybe 10. Every bit of it reminded me of my childhood, of afternoons before responsibilities, and I was sitting somewhere I had never even visited, the texture and flavor identical to something I last tasted more than 20 years ago. I have no doubt that had I been raised in the South instead of Chicagoland, TBS on every day in place of WGN, Skip Caray crooning rather than Harry, my grandma and I would have spent many afternoons at The Varsity. We would have written some other history filled with some other comfort food. I would have dreamed about Frosted Oranges for years and then, one surface-of-the-sun-hot summer Saturday up in Indiana, I would have stumbled on Miner Dunn. I would have ordered orange sherbet and spooned the whole metal dish. I would have remembered something about being 4. I would have cried about my grandma. I have no idea when we'll come back to Atlanta after today. We might never come back. If we do, we'll eat at The Varsity in what will be a stunted attempt to recreate experiences that are impossible to recreate. Spontaneity and nostalgia can't be planned. Memories won't spill back again. But I can open my eyes this time. I can stop pretending all this never happened. As most followers know by now, our schedule breaks down to 120 games in 119 cities in 152 days. Even our rudimentary journalism math skills can deduce that means 33 days not occupied by a game. (Honest. Remember Easter eve, when we saw the Jupiter Hammerheads and the Palm Beach Cardinals, who share a stadium, play each other in a doubleheader at home?) Many of those extra days are travel days, not traditional off days. One day, we drove 18 hours from Reno, Nevada, to just south of Denver. Another, we drove 15 hours from Salt Lake City to Omaha, Nebraska. Never a dull moment, for us or anyone else in the minors. The season itself is a grind. Just because teams are on the road doesn’t mean the front office staff isn’t at the stadium working eight- or nine-hour days. Our schedule is sort of similar. When we don’t have long drives, we’re hunting for free wi-fi, outlets and a place to crash. On Monday, we worked seven hours in coffee shops – transcribing, writing, editing, publishing and planning – and, in order to not wear out our welcome, I continued to drink cup after cup, black and dark – and later with frothy milk, to lessen the shakes. It’s not always that simple to find time and the space to be productive. Today was one of those days. 8 a.m.: We woke up in the back of the Element and started the morning ritual of moving all of our belongings from the front of the car to the back. We have it down to 11 minutes. 8:20: Drove to a gas station to use the bathroom, brush our teeth and buy coffee and milk. 8:30: Merged onto I-40 West. Matt drove while I transcribed 45 minutes of interviews with Clinton LumberKings players and staff. I drove while Matt caught up on emails and searched for a Chipotle on his phone (a burrito is almost a day’s worth of relatively-healthy calories for just $6.75). Never did find one. 11:50: We gained an hour for the last time this season (thanks, Central Time Zone), and checked into a KOA for the seventh night this season. 12:20 p.m.: Stopped for lunch at Double Dogs in Bowling Green, Kentucky. We were able to continue our streak of eating delicious – but not healthy – food while watching the first three innings of an eventual loss for the Cleveland Indians against the New York Yankees. 2-7: Returned to the KOA and pulled a bird-poop-splattered picnic table into a sliver of shade in order to catch up on more emails, voicemails and social media messages. We researched the teams we’ll be visiting on our upcoming 11-day stretch of games and sent out media credential requests. All this while sweating through (and stinking in) 90-degree heat, mosquitoes, spiders and the toddler and baby a couple campsites over who cried and screamed for hours. We’ll never forget the sound of their names – Zachary and Bubba – coming from the mouths of their exasperated parents. 7:15-8:30: We prefer to eat local, but after splurging ($25) on a night at KOA (we still sleep in our car, but they have Internet and showers), we decided to use the Bob Evans gift card we’ve saved since Christmas. Also, when you haven’t showered in 36 hours and you smell like bug spray, it’s best to go to a restaurant you know will welcome you. NASHVILLE, Tennessee | Sitting less than 500 feet from an enormous scoreboard shaped like a guitar here at Greer Stadium, we think it’s appropriate we pay homage to the music selection that has silenced boredom during long car rides and provided a soundtrack for this journey. We have driven thousands of miles without actually listening to the radio or a CD or an iPod, yes, because sometimes the hum of our Element and the pounding on our laptop keys is plenty when taking in the scenery. There are, however, four albums we play in heavy rotation: The Grateful Dead’s Workingman’s Dead, Arcade Fire’s The Suburbs, Florence + The Machine’s Ceremonials, and Bob Dylan’s The Bootleg Series Vol. 7: No Direction Home: The Soundtrack. We’ve driven more than 18,000 miles and we still have about 10,000 more to go. Post your favorite road trip music on our Facebook page or over on Twitter. We’ll include them in a future blog post. TULSA, Oklahoma | Our Honda Element is not a large car, no matter how spacious it feels when we stretch our Lilliputian legs in the back seat at night. We’ve spent about half of the last 68 days in the car, the other half in press boxes and plastic stadium seats. Our bags are packed meticulously so that they fit in the car and, more important, so the car stays relatively organized. There’s little space to lose anything and, if we remember to check our little corner before we leave the press box every night, it’s pretty difficult to leave things behind. Laptop charger: The first of our casualties, we left a standard MacBook Pro charger in the press box in Pensacola, Florida. Sunglasses: We lost a screw and one arm in a parking lot somewhere in Albuquerque, New Mexico. We’ve shared one pair of badass aviators ever since. 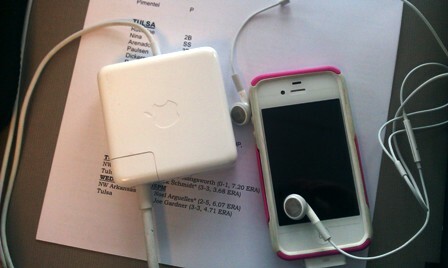 Headphones: We have two new pairs now, but have pitched two old pairs along the way. Each was down to one working ear. Transcribing conversations is really boring in mono. Cell phone: Our poor Droid died after we dropped it in the parking lot at Barber Honda’s Bakersfield, California. Laptop battery: The darn thing just petered out in Colorado Springs, Colorado. We ordered a new one and had it shipped to friends. Our friends are more reliable than our laptop batteries. Slip-on shoes: Soles peeled away for good in Davenport, Iowa. They were loved. Socks: Because what would a five-month road trip be without lost socks? What would life be without lost socks? Fingernail clippers: Our nails are now roughly the length of a standard baseball bat. An Iowa Cubs pocket schedule: The only one not in a pile of 53 other team pocket schedules. We remain hopeful it’s somewhere in the car. One of us is a bit obsessive-compulsive. Four quarts of oil: Somewhere between Bakersfield, California, and Casper, Wyoming, where we learned our oil filter was punctured and we had been leaking oil for ... we don’t want to know how long. We have 84 more days before we head home. We can only hope this will be the end of our list of lost stuff. We know it won’t be. When we crossed the Nebraska border around 5 p.m. on Memorial Day, we threw our arms in the air and yelled as if we were on one hell of a roller coaster. Funny enough, it was the flattest land we had driven since leaving California 10 days earlier. The excitement was solely about our return to the great Midwest. After a swing through the South and a long stint in the West, it felt good to be back in the Midwest, even if it’s only for a short while, and even if it’s still thousands of miles from home. It’s not homesickness by any means because, well, we don’t actually have any home to miss and the thought of having to move again and then unpack all of our boxes sounds worse than sitting through a 32-inning game. The excitement is more the familiarity of the Midwest, which, in case you forgot, Matt had not seen since February 27 and I last saw April 2. The familiarity is in the relatively flat land, constant cell phone service, cheap gas prices, corn fields and, of course, family and friends. It wasn’t until we were about to return and a friend had to remind us that a holiday was fast approaching that we realized we had been living in a baseball vacuum. Our daily news feeds of newspapers and websites has basically been nonexistent — save for some national sites and a little time with magazines — even though we can access everything on our phones. All that media consumption has been replaced by replying to emails, yelling at GPS and, naturally, watching baseball. Most of our family, friends and news updates come from Facebook and Twitter updates. Yes, it’s great to be in the Midwest for 12 days. But it’s great to be two months in — 50 teams down, 20 states visited — and think this is still really freaking cool. A week ago, we woke up in Visalia, California, and the odometer on the Element read 125,264. We arrived in Tacoma, Washington, this morning and pulled into a Starbucks to do some work, our odometer up to 128,388 miles. To put this roundabout Western swing in perspective, we’ve driven 3,124 miles through eight states in the last week, and we still have a pair of 13-hour drives ahead, from Tacoma to Salt Lake City on Saturday, then Salt Lake City to Omaha on Monday (which, we just remembered, is Memorial Day). In the last week, we have driven through a desert, touched snow, saw unleaded gas for $3.49 and $4.59, searched for Wifi and outlets to charge our computers and, finally, caught up on sleep. Here are some other memorable moments. 1. Casper, Wyoming has more than a dozen hotels. The city of about 55,000 is the last major stop on I-25 North until you arrive in Buffalo about 114 miles later, a prime destination for travelers who can’t bear to drive another two hours. Hoping to take a break from the road, we arrived in search of a room. Turns out thousands of high school rodeoers beat we travelers passing through. We stopped at one hotel and found no vacancy. We stopped at another, no vacancy. We stopped at a third … no vacancy. We found a room at the fourth hotel we tried and were told it was one of 40 left in the city. And sadly, after all that work, we didn’t get to see any cattle-roping teenagers. 2. Burritos from the first Chipotle do, in fact, taste a little different. In 1993, the first location replaced a Dolly Madison Ice Cream on East Evans Avenue near the University of Denver. When you walk in, there’s no glass case to peer at the selection of ingredients. The counter has space for one, maybe two, people to order and another person to pay. The familiar wood and interior décor is the same, but the dining area seats less then two dozen. The bathrooms are often roped off so employees can drop through a hole in the floor to the basement storage room. As far as the burritos themselves, the tortillas were thinner, and the peppers and onions tasted like they had a different seasoning, neither of which is a bad thing. 3. At mile marker 451 on I-90 West in Montana, you hit the top of a hill and fully understand why they call the state Big Sky Country. The city of Billings sits below and if you can put your thumb and index finger a foot or so in front of your face, the tallest buildings fit between them. The city isn’t all that far away, the sky is just that darn big. Fluffy clouds billow above and you have to blink a few times to tell if they are really clouds or part of the snow-capped mountains. About 15 miles later, a mountain chain opens in front of you and no doubts remain. 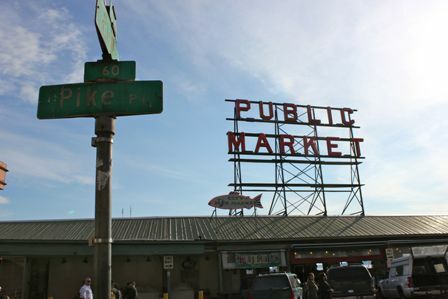 Photo: We made it to Pike Place Market in Seattle just as the vendors were closing for the day. If we hadn’t hit snooze three times that morning, perhaps it would have been a more memorable moment. SALINAS, California | More than half a century ago, John Steinbeck traveled around the country with his loyal French poodle, a negotiator named Charley. They spent their days in the cab of a forest green GMC pickup, their nights in a comfortable white camper top loaded over the bed, or so the story goes. The book that resulted, Travels with Charley: In Search of America, is the last of the dozens of books Steinbeck wrote about his country, an unforgettable book for those who have read it, though largely forgotten among the overwhelming enormity of his other classics. I opened the book for the first time during the summer between my freshman and sophomore years of college, 19 and still impressionable. I remember the first page and the words that stayed with me: “When the virus of restlessness begins to take possession of a wayward man, and the road away from Here seems broad and straight and sweet, the victim must first find in himself a good and sufficient reason for going. We are bums, Carolyn and I. We live out of our car, scrounge food where we can, shower at gyms. This trip is at best quixotic — ideal, but not practical — and it owes as much to William Least Heat-Moon and Mark Twain and Miguel de Cervantes himself as it does to the goateed Californian who gave us the Joads and the Trasks. But Steinbeck provided the first glimmer of a dream, the Mother Road, of sorts. Without his own Operation Windmill, ours would have never started. 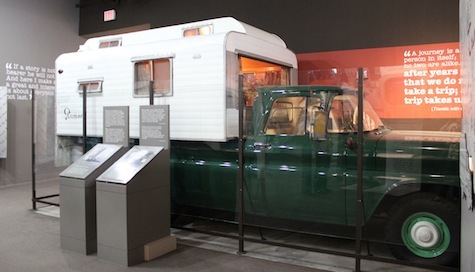 The day we realized his camper, named Rocinante after Don Quixote’s horse, is housed permanently at the National Steinbeck Center two blocks from the house in which he was raised in Salinas, we scheduled a detour between stadiums. From the street, the center is relatively modest, one story and covered with glass. A mural is painted on the side of a building across the street, images pulled from Steinbeck’s pages. The downtown that surrounds it is quiet on a Tuesday morning. An antiques store. An Internet cafe. A movie theater with a marquee. A parking garage tucked behind other buildings to maintain some architectural integrity. No crosswalk signals. Rocking chairs. Inside, the rooms are packed, ordered chronologically from Steinbeck’s birth to his death, with larger displays for his more lasting works. Even if you were forced to read Of Mice and Men or The Grapes of Wrath or East of Eden for a class, it all overwhelms with its amount of information and passages and meaning. Steinbeck published Travels with Charley about six years before his death, so the display for the book is near the end. I knew Rocinante was there, on the other side of a wall that cut off before the ceiling, but its weight — “three-quarter ton, ... capable of going anywhere under possibly rigorous conditions” — hung over me. I wanted to run through every other room to the end. I don’t remember what I was reading when the camper first landed in my peripheral vision, something about The Winter of Our Discontent, maybe. My head turned and there it was. I looked at Rocinante, all cleaned and polished and safe behind plastic, and thought first about the years that it filled my dreams. The book, published a generation before I was born, dominated me for a decade. It developed and festered and fell away and returned. Changed my life. Then I remembered the one person I know who has even more invested in the book. “Only you might enjoy seeing this more than I do,” I thumbed on my phone to Chris. I met him at a baseball game up in Toronto six years ago. He was a new father then, one of the top magazine writers on the continent now. His oldest son is named Charley. I dropped my eyes to the carpet. It was wet. We never want to miss a story, so we always have notebooks in our back pockets and pens in our hands. This blog is a look at those skinny scribbled notebook pages. Short stories about regular folks, greasy spoons, life in America -- right here, every day.